O son of Jerusalem, cry 'Allah is great!'" The song appears in the wake of several terror attacks carried out by Palestinians using cars to run over Israelis in Jerusalem in recent weeks. Four people have been killed and dozens injured in these attacks. It honors the terrorist murderers and the terrorist who attempted to murder Rabbi Yehuda Glick because of his work to secure rights for Jews on the Temple Mount. The song dedicates one stanza to each terrorist. 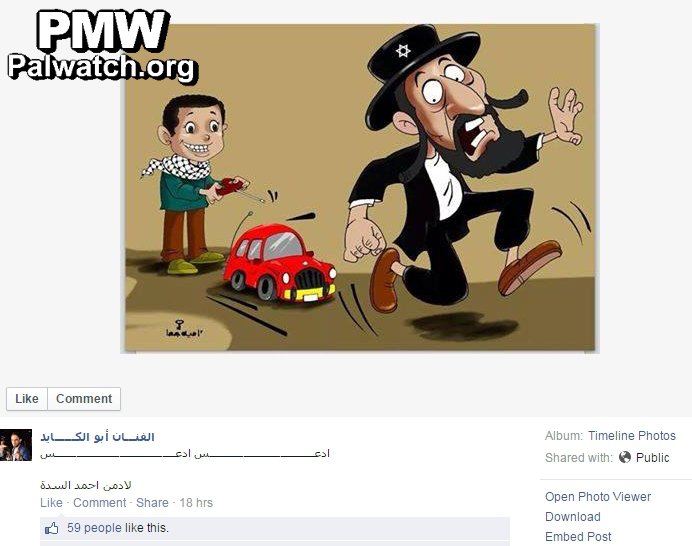 On his personal Facebook page, singer Muhammad Abu Al-Kayed also posted this ‎cartoon, showing a Palestinian child trying to ram a car operated by remote control into ‎a fleeing Jew. 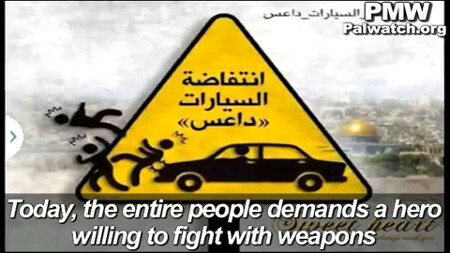 During the recent tense days in Jerusalem, Abbas’ Fatah movement has posted similar ‎cartoons and messages, encouraging Palestinians to carry out terror attacks by car, ‎as Palestinian Media Watch has reported. Abbas’ advisor has praised ‎the car ‎terrorists who killed 4 and Abbas himself has honored the terrorist who attempted to murder Rabbi Glick. Notes:‎ ‎“You (i.e., Israelis) ran over a girl two months ago" apparently refers to an accident that occurred on Oct. 19, 2014 in the West Bank, when a Jewish Israeli man ran over and killed five-year-old Inas Dar Khalil and critically injured five-year-old Toleen Asfour. According to official Israeli news sources, the man called the police to report the incident, which an initial investigation revealed to have been an accident.